Barcelona probably is Spain's most cosmopolitan city, with an atmosphere that is far different from other places in Spain. Barcelona is the perfect weekend destination, a city break to remember! Barcelona is a perfect holiday destination, it offers culture, night life and sunny Mediterranean beaches. The cosmopolitan life in Barcelona is just great and the sea and the beaches are just a few steps away from the bustling city centre! Barcelona belongs to the autonomous region of Catalonia (Cataluña - Catalunya) and the Catalan language is used widely, but without problems if you speak Spanish: Traditional Spanish is always useful and welcome in Barcelona, as well as many other European languages. Barcelona is the second largest city in Spain, both regarding size and population. The City of Barcelona has a population of 1.515.000. Including the suburbs and areas around Barcelona City the number climbs to more than 4.000.000. As a tourist destination Barcelona offers far more than all other places: It is the only large city in Europe with 4 kilometers of sandy beaches on the sunny Mediterranean Coast. One can without effort mix sunny beaches and sunbathing with trendy metropolitan life, culture and history when visiting Barcelona. Barcelona's heart is La Rambla or Las Ramblas. Right in the city centre of Barcelona you find the beautiful and bustling avenue Las Ramblas - La Rambla, where you actually walk in the middle of the avenue. The feeling you get when strolling around at La Rambla in Barcelona is that it is the cars that are driving on the sidewalks. Please note: Be aware of pickpockets and other scams when you visit the centre of Barcelona. Spaniards are often friendly and happy to offer help to tourists and to give advise. But unfortunately many thieves uses the Spanish reputation of being helpful to steal from tourists. Never let anyone get too close to you, and always keep an eye on all your belongings. Do not trust people you meet on the streets that offers help without being asked! If you need help, make sure to ask the local police or ask the employees in a shop! Flower kiosks, newspaper stands, vendors, tourists and Spaniards all meet at La Rambla in Barcelona. 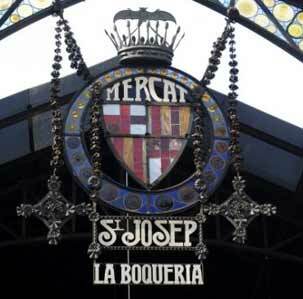 On La Rambla / Las Ramblas in Barcelona you also find the biggest food market in Europe: Mercat La Boqueria. Barcelonas market Mercat La Boqueria is fascinating: Mercat la Boqueria is a world of fresh food, restaurants, bars, spices and flavors. The old town in Barcelona consists of three different districts: The Gothic Quarter - Barrio Gótico, The bohemian district Raval, and Rivera. In Barcelona there are many historical monuments, and the narrow streets are great for strolling around. Artists and musicians are found everywhere. The cultural visits in Barcelona are far too many to discover during a short visit to the city. There are more than 50 museums in Barcelona, in addition to the large virtual outdoor museum that the architecture in Barcelona represents. The following is only a part of of all that can fill your days during your stay in Barcelona: (More information can be found in Barcelona's tourist information on the web: http://www.barcelonaturisme.com). Bars and restaurants around Las Ramblas are quite touristy and are best avoided. The El Born district is a favourite with locals and full of bars, particularly around Passeig del Born. Other areas like Maregmagnum and Port Olympico are also full with bars. And always remember Las Ramblas it self! In the warm months there is always something happening on Barcelona Las Ramblas making it a great place to stroll around, day and night. It is difficult to describe briefly what is worth to see in Barcelona, the capital of Catalonia. It all depends on the time you will spend in the city. La Sagrada Familia: La Sagrada Familia is the biggest attraction in Barcelona. La Sagrada familia is work of Antoni Gaudi. The architect Antoni Gaudi was born in Reus, about 120 km outside Barcelona. You can see Gaudis fantastic work at 14 locations in Barcelona. In the very City Centre of Barcelona you can see Plaça Reial, Palau Güell on Nou de la Rambla and Casa Batllo and La Pedrera on Passeig de Gracia. Ironically, Gaudi didn't start or finish his most famous work, the cathedral La Sagrada Familia. Gaudi's buildings are just as fascinating. La Sagrada Familia - Museu del Temple Expiatori de la Sagrada Familia. Gaudi's masterpiece is the church where he himself spent 18 years of his life: Construction is still ongoing. Today the temple is visited as a museum and next to the impressive building, there is a small project where the buildings history is shown in photos along with personal items that belonged to Gaudi. C / Mallorca 401, Barcelona. Open daily from 9.00 o'clock to between 18.00 and 20.00 depending on the season. C / Olot at the park Güell, Barcelona. The Picasso Museum in Barcelona is one of the three as "Picasso Triangle" since Malaga opened last autumn 2003. The museum which complements the triangle is the Picasso Museum in Paris. Parque de la Ciutadella. Plaza de Armas, Barcelona. Opening hours: Monday to Sunday 9.00 - 21.00. Closed on Tuesdays. The Contemporary Art Museum offers the visitor a broad view of art's development over the last 50 years. Plaça Angels Nr.1. Open every day but different times: Tuesday to Friday between 12.00 and 20.00. Saturday between 10.00 and 20.00. Sunday between 10.00 and 15.00. The Joan Miró Foundation is Catalonia's favorite and the museum is a must to get familiar with Barcelona's art. Placa Neptu, Montjuic, Barcelona. Open on Tuesday and Wednesday between 10.00 and 19.00. Thursday 10.00 to 21.30. Friday and Saturday 10.00 to 19.00 and Sunday from 10.00 to 14.30. An interesting museum showing Spanish sculptures. Plaça Sant Lu 5-6, Barcelona. Open Tuesday - Saturday 10.00 to 17.00. Sunday 10.00 to 14.00. Closed on Mondays. Barcelona´s Bullfighting Museum, where costumes and objects from bullfighting can be seen. Plaza de Toros Monumental. Open daily 10.30 - 14.00 and 16.00 - 19.00 during the bullfighting season (summer). Days when there is bullfighting, it is open between 10.00 and 13.00. Barcelona's historic city museum. Art and archaeological objects, etc..
Plaça del Rei. Open Tuesday to Saturday 10.00 - 14.00 and 16.00 to 20.00. Sunday 10.00 to 14.00. Art and culture OK. But Barcelona is football as well. A visit to the Football Club Barcelona Museum is a must when you visit Barcelona! 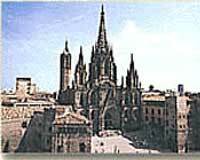 The present Gothic cathedral was built between 1298 and 1450. Avenida de la Catedral, Barrio Gótico, Barcelona. Guided visits on Fridays and Saturdays, by arrangement, for information call Tel: 93 315 22 13. Religious services on weekdays: 9.00, 10.00, 11.00, 12.00, 19.00. Holidays: 9.00, 10.30, 12.00, 13.00, 18.00 and 19.00. The Airport in Barcelona is situated at 13 km from the city. Barcelona’s airports name is El Prat. By car on Autovia C-246 by Castelldefels i takes aprox. 15 minutes to reach Barcelona city. The taxi stations are situated in the exit of the terminals A B and C.
It is easy and cheap to reach Barcelona by train and by bus from the airport. The train station is connected to the Airport and the airport buses leaves from the terminals A B and C.
Gerona: Gerona Airport is located 100 kilometers north of Barcelona. From the airport in Gerona there are frequent busses to Barcelona City. Reus: Reus Airport is located 90 kilometers from Barcelona. There are frequent busses from the Airport in Reus to central Barcelona. The airport busses from Reus stop on the railway station Barcelona – Sants. Transport from the airport by Rapid Bus: The Rapid Bus leave from B terminal in front of Joan Miró mural and goes to different destinations around Barcelona: Reus, Girona, Tarragona, Lleida and Figueres. Airport – Lleida: Departures: 09.30, 18.30. Journey time to: Girona 1 hour 35 minutes. Figueres 2 hours 15 minutes. Tarragona 1 hour. Reus 1 hour 30 minutes. Lleida 2 hours. Prices: Girona 17,70€, Figueres 23,60€, Tarragona 11,75€, Reus 14,05€, Lleida 23,70€. Barceloneta Beach - Metro stop "Barceloneta" (Yellow line) and a 10 minutes walk or walk from La Rambla: 20 minutes. Icaria Beach - Metro stop "Ciutadella Vila Olimpica" (Yellow Line) and a 10 minutes walk. Bogatell – Between Icara Beach and Mar Bella Beach. (Quiet and a nice promenade). Mar Bella Beach (Many nudists!). Metro stop "Poblenou" (Yellow Line) and a 20 minutes walk. Sitges Beaches - Outside Barcelona. Take a train from Sants station. Approximate 30 minutes. Among the many topographical features relating to Jews in Barcelona, one of the most memorable is the Monjuich, the Mons Judaicus or Mountain of the Jews, where for centuries, the Hebrew community buried its dead.